As Boy Peers Curiously Over Border Wall, His Artist Asks: 'What Is He Thinking?' : The Two-Way JR, a French street artist, hasn't answered that question — and that's the point. His massive artwork on the border, which coincided with the decision to rescind DACA, is the "start of a discussion." 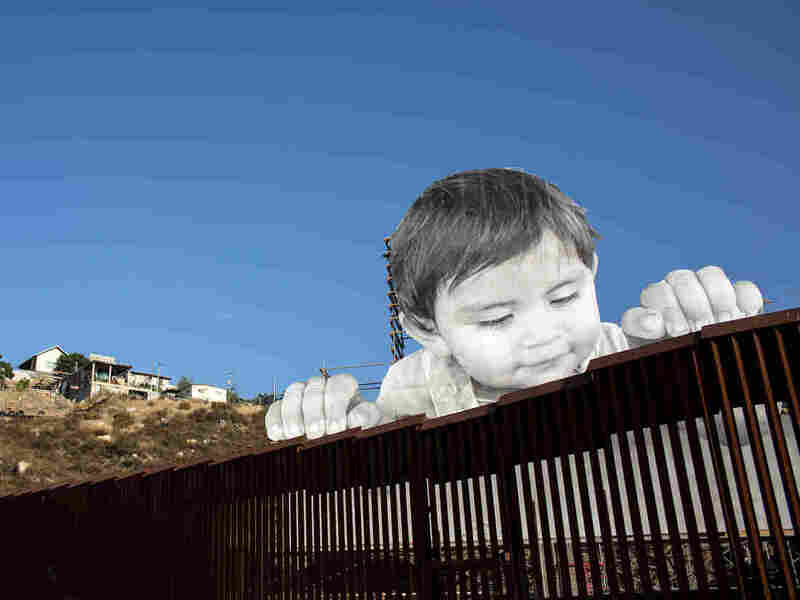 One morning, when JR awoke, an image lingered from his dreams: The wall along the U.S.-Mexico border, and above it a young kid peering curiously over. A child just 1 year old, who has "no idea that's a wall that divides people — he has no idea of the political context," JR imagined. "What is he thinking?" He had no answers to his question, but the question stayed with him — and eventually, the French street artist decided to give it form. 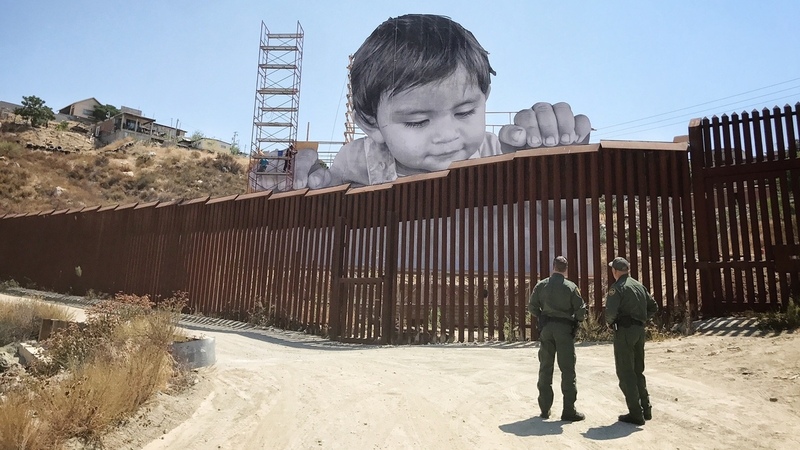 This week, within days of the Trump administration's decision to rescind the Deferred Action for Childhood Arrivals program protecting 800,000 immigrants, JR erected a massive artwork towering dozens of feet above the existing wall. The work built by French artist JR peers over the U.S.-Mexico border at Tecate, Calif., earlier this week. The boy, hair swept to the side and focus drawn by an unseen object, peeks with evident interest from the Mexican side over the slats of the wall at Tecate, Calif., as if looking over the railing of his crib. And as JR tells it, he didn't have to search long for the work's inspiration. While seeking residents willing to let him build on their land, he met a woman who was game for the project — and as they spoke, he noticed a little interloper eavesdropping on their conversation: her son. "There was a little kid looking at us the whole time with two hands on the side of his crib looking at us," the artist who goes by the pseudonym JR tells NPR's Ari Shapiro, "and I was like, 'Damn he looks exactly like that kid I dreamed of.' "
With the mother's permission, he took the child's photograph, blew it up to gargantuan proportions and enlisted help to get the work built. The project was something of a change of pace for the artist, who typically works in a different manner — placing images of his own creation onto walls, rather than building around them. For him, walls have often been a kind of canvas, rather than a means of dividing people. But with this work, one of his goals was clear from the start: "Basically, we had to build a bigger wall to make this [border] wall look ridiculous." Then, his work in California happened to dovetail with events in Washington, D.C.
After Attorney General Jeff Sessions announced Tuesday that Trump would implement a six-month wind-down of DACA, an Obama-era program that protected certain immigrants who were brought to this country illegally as children, suddenly people began reaching out to JR on Instagram and elsewhere. And many of these new correspondents were people covered by DACA themselves, who fear for their status even as the wind-down is set to be litigated in court. But that's not quite what touched him the most, he says: "Most of the people, if you read the comments, they were not talking politics or they didn't mention the name of the president. It was about people." As a French national, he is only just "discovering this whole context," he says, and "by going there I get to learn and hear about it from the people and be able to engage in a discussion." And he hopes that while the artwork is up for another month or so, discussion happens not just between people on either side of the wall, but actually through its slats — in other words, across the border itself. Ultimately, he thinks of something he heard from the mother, who from her window now looks up to see the massive silhouette of her child every day. "She said, you know, it's my son and I can recognize him, but I hope for the others, it represents any kid, any person — anyone that has dreams, and dreams that are not alienated by any political vision or any prejudice," JR says. The boy glances down from the Mexican side at two Border Patrol officers, who return his stare from the U.S.
"I couldn't wish better for the start of a discussion."